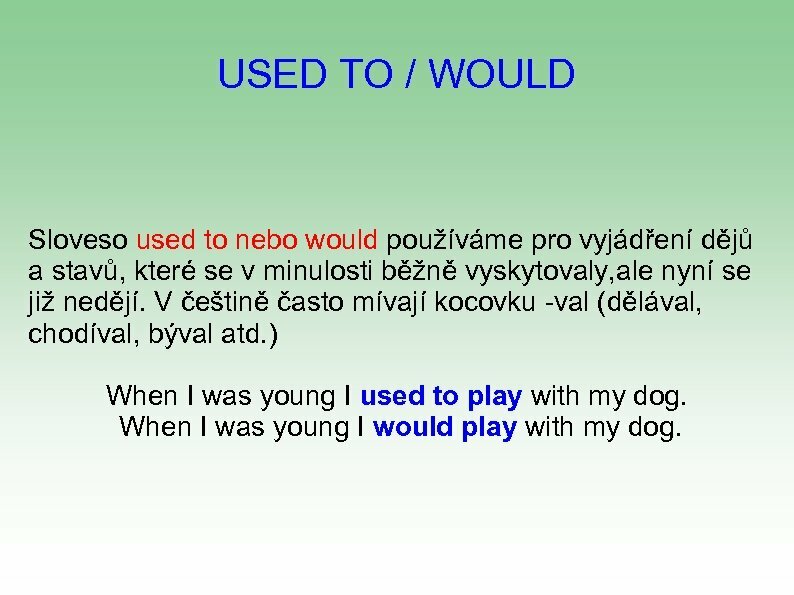 Used to/ would, be/ get used to Autorem materiálu a všech jeho částí, není-li uvedeno jinak, je Romana Petrová. Dostupné z Metodického portálu www. rvp. cz, ISSN: 1802 -4785. Provozuje Národní ústav pro vzdělávání, školské poradenské zařízení a zařízení pro další vzdělávání pedogických pracovníků (NÚV). USED TO / WOULD Sloveso used to nebo would používáme pro vyjádření dějů a stavů, které se v minulosti běžně vyskytovaly, ale nyní se již nedějí. V češtině často mívají kocovku -val (dělával, chodíval, býval atd. ) When I was young I used to play with my dog. When I was young I would play with my dog. Used to - tvar He used to live in California, but now he doesn´t. Did he use to live in California? - Yes, he did. No, he didn´t. He didn´t use to go to school in California. Pozor, zatímco used (používal) vyslovujeme [ju: zd], spojení USED TO vyslovujeme [ju: stә]. would Sloveso WOULD nepoužíváme, když se jedná o stavy. Můžeme ho použít pouze pro činnosti, pro to, co někdo dělával, ale ne pro to, co prostě bývalo. USED TO je možné požít jak pro stavy tak pro činnosti. A tree would stand in front of the school. A tree used to stand in front of the school. I would live in Poland. I used to live in Poland. would v záporu V záporu se význam would mění: I didn't use to play with my toys. (Nehrávala jsem si s hračkami). I wouldn't play with my toys. (Nechtěla jsem si hrát s hračkamii). We didn't use to go out much in the winter months. (Nechodívali jsme moc ven v zimě). We wouldn't go out much in the winter months. (Nechtěli jsme moc v zimě chodit ven). 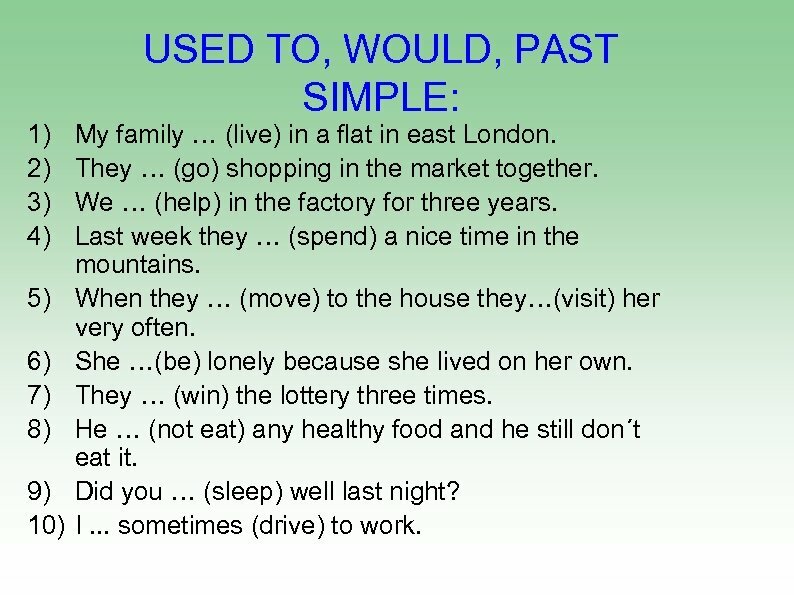 1) 2) 3) 4) 5) 6) 7) 8) 9) 10) USED TO, WOULD, PAST SIMPLE: My family … (live) in a flat in east London. They … (go) shopping in the market together. We … (help) in the factory for three years. Last week they … (spend) a nice time in the mountains. 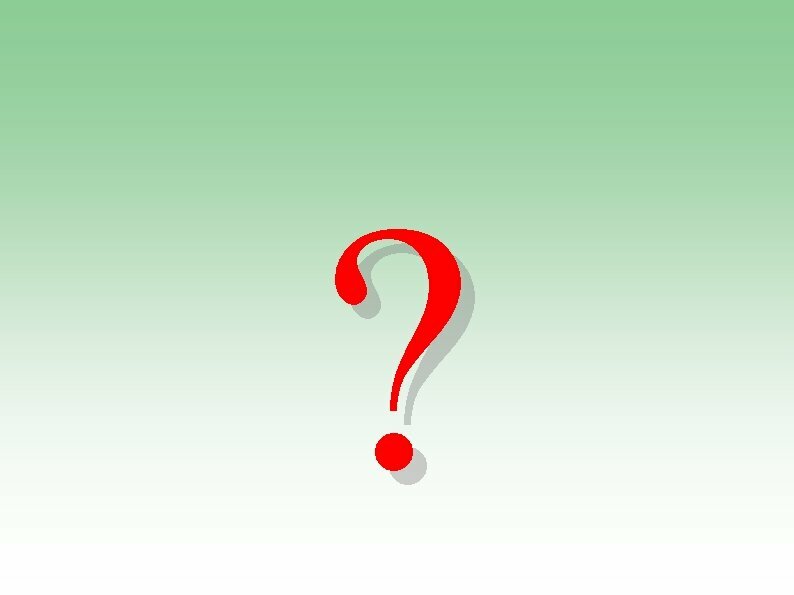 When they … (move) to the house they…(visit) her very often. She …(be) lonely because she lived on her own. They … (win) the lottery three times. He … (not eat) any healthy food and he still don´t eat it. Did you … (sleep) well last night? I. . . sometimes (drive) to work. Solution: 1) 2) 3) 4) 5) 6) 7) 8) 9) 10) My family used to live in a flat in east London. They would go shopping in the market together. We would help in the factory for three years. Last week they spent a nice time in the mountains. When they moved to the house they would visit her very often. She used to be lonely because she lived on her own. They won the lottery three times. He didn´t used to eat any healthy food and he still don´t eat it. Did you sleep well last night? I would sometimes drive to work. 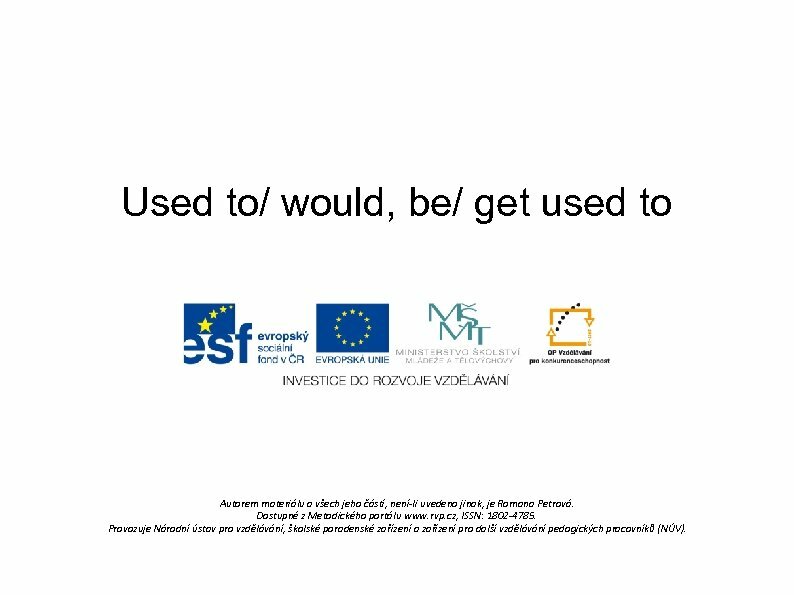 be used to doing V angličtině používáme 'to be used to doing' , abychom vyjádřili, že jsme na něco zvyklí. I'm used to getting up early. I've done it for quite a long time. Lina comes from Italy. She has lived in England for over a year so she is used to driving on the left now. They've always gone on holiday to Spain so they aren't used to the cold weather here. 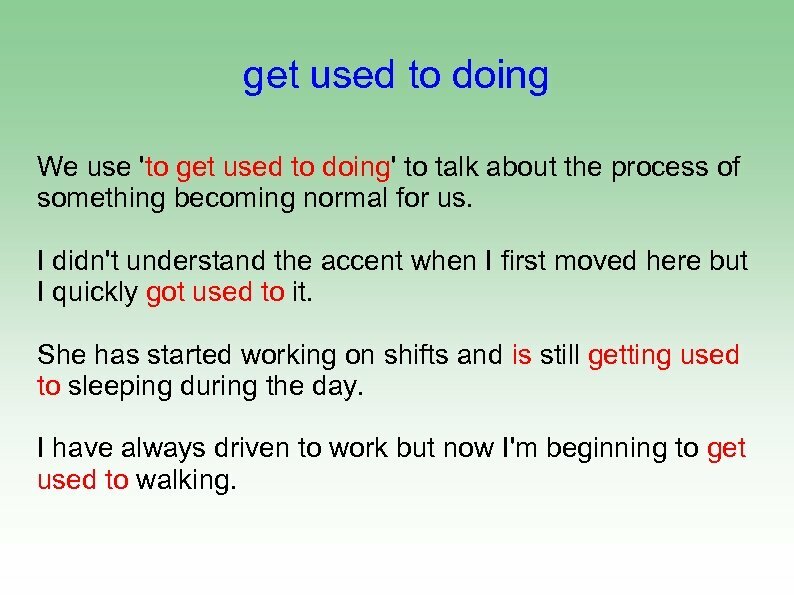 get used to doing We use 'to get used to doing' to talk about the process of something becoming normal for us. I didn't understand the accent when I first moved here but I quickly got used to it. She has started working on shifts and is still getting used to sleeping during the day. I have always driven to work but now I'm beginning to get used to walking.